New website features refreshed design, integration with global partners & video series. 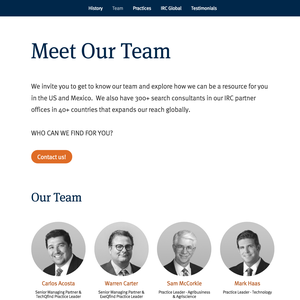 We are excited to announce the launch of a newly designed website which includes better integration with our global partners in IRC Global Executive Search Partners, a cleaner design and improved alignment with our core recruiting and search practices. The QualiFind Group is a recruiting and executive search firm focused on providing talent acquisition and consulting services to organizations in the US and Mexico. Headquartered in Chula Vista, California, with US branch offices in Atlanta, St. Louis, and San Antonio and Mexico City, Guadalajara, Tijuana, and Panama City. You can visit The QualiFind Group online at: http://www.qualifindgroup.com. IRC is a global alliance of executive search firms, united in their commitment to provide the highest possible standards in management recruitment services. IRC is comprised of more than 300 executive search consultants in 80+ offices across 6 continents. IRC’s clients range from large multinationals to mid-market companies where more than 30,000 search assignments have been completed on behalf of more than 2,000 clients in almost every conceivable industry segment and function. The QualiFind Group is the exclusive search partner for Mexico and Central America and is one of several firms that represent the US market. Hiring more locals to fill top posts at Western multinational corporations (MNCs) operating in Asia doesn’t just further inclusion, it’s good business. Localising leadership requires overcoming cultural conditioning in certain Asian cultures that may, in certain circumstances, be a hindrance to upward mobility in large global organisations, but organisations that are cultivating local management in the region seldom regret it.